Hey friends! I’m so happy you’re joining me today for Altenew’s April 2019 Stamp/Die/Stencil/Paper Pack Release. If you’re making your way through the hop from the beginning then you would have come from Lydia Evans’ Blog. If you’re starting here, WELCOME! You’ll find a link to the next blog at the bottom of the post; along with a complete list of hoppers. For my first layout I used the Alluring Blooms Paper Pack. The colors in this pack are GORGEOUS!!! I really didn’t know where to start! I was immediately drawn to the paper with the large pink flower with the blue leaves. What an interesting and beautiful color combo! I fussy cut those floral images from two of the 6×6 patterned papers. I then positioned those floral images in the center of the layout. I wanted to add a bit more color so I grabbed two other floral patterned papers, fussy cut those images, and tucked them along side the blue leaf florals. Before I adhered anything down, I applied a layer of clear gesso and used watercolors from my stash to add a little orange to the background. I then positioned and adhered the floral images to the white cardstock background. I realized I wanted a bit more color and interest, so I grabbed the Fine Frames Circles Die Set and another patterned paper from the same Alluring Blooms Paper Pack. I added the circles to the left and right of the floral cluster. I added my photo, from a cruise that my husband and I went on in 2012, to the center of the florals. I kept embellishing minimal because I wanted the focus to be on the gorgeous patterned papers. I added a few Wood Veneer Epoxy Buttons, and my title using Black Alphas from the Live Your Dream Scrapbook Collection. I also added a sprinkle of Enamel Dots from the Our Family Scrapbook Collection and a splash of black splatters for the final touch. For my next layout, I used the Summer Garden Paper Pack. The great thing about these Altenew 6×6 Paper Packs is you get four of the same pattern! 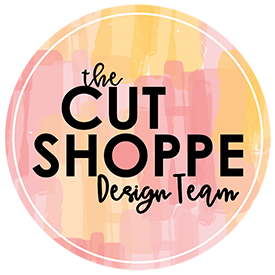 I started my layout with the Untamed Heart Cut File from The Cut Shoppe. I then took four of the same patterned paper from the Summer Garden Paper Pack and positioned those papers behind the cut file. Because you get 4 of each design in the Altenew 6×6 Paper Packs I was able to achieve the look of a full 12×12 piece of patterned paper! I added machine stitching around the heart once I had those 6×6 pieces of patterned paper adhered. I then fussy cut a couple floral images from two of the patterned papers from the same Summer Garden Paper Pack. I added those florals to the upper left and lower right hand corners of the layout. I positioned my photo on the bottom right and then moved onto embellishing. I used the Black Alphas from the Reflection Scrapbook Collection to spell out my title in the upper left corner. I also added a Camera Die Cut, tucked a couple Wood Veneer Leaves in the flower cluster next to the photo, and I also added a scattering of Enamel Dots from the Our Family Scrapbook Collection. Now you can take a look at my process video! Altenew will also draw a winner to receive a $20 gift certificate from the comments left on each designer’s blog on the blog hop list below. All winners will be announced on the Altenew Card Blog on 5/4/2019. GOOD LUCK! With the list of talented designers on this blog hop, I have no doubt that you are finding inspiration as you are making your way through this blog hop! Next up is Norine Borys. This blog post contains affiliate links. This means I will receive a commission (at no cost to you) from items purchased from those links. Hi friends! I’m back with a new layout that I recently created for Pretty Little Studio using the XOXO Collection. I started by creating an offset in Inkscape. [A step-by-step tutorial can be found in the process video at the bottom of this post.] I then uploaded the outline of the Butterfly Cut File, that is available in the Pretty Little Studio Shop, into Cricut Design Space. Once the butterfly was uploaded, I sized and duplicated the butterfly numerous times. Once I had the outline of the butterflies sized, I selected the whole group and duplicated all of the butterflies. I then used the Contour Feature in Design Space to turn the duplicated butterflies into a solid image. Next, I cut the butterfly outlines in white cardstock and the solid butterflies in numerous pattern papers from the XOXO 8×8 Paper Pad and two pieces of vellum [Never Ending Love & I’m Yours] from the same XOXO Collection. After all of the butterflies were cut, I adhered the outline to each of the patterned papers. I then used a Heidi Swapp stencil and a light pink acrylic paint to paint lines on my white cardstock background. I then positioned the butterflies vertically in the center of my layout. I positioned my photo to the right of the butterflies and added a few fussy cut florals. I actually cut these florals from the 8×8 Patterned Paper Pad packaging! Last Spring I guest designed for Pretty Little Studio and went through an entire pack of the Floral Die Cuts. They are my absolute fave! I still have the 8×8 Floral Cardstock Patterned Paper, the Vellum, and the Acetate Sheet that has this same floral design, but I can’t bring myself to cut into them! I’m 100% hoarding those papers! HA! I really wanted the embellishing to be limited because I wanted the focus to be on the butterflies. For my title, I grabbed the word “Spring” from a Freebie pack of die cuts I had received in a previous Pretty Little Studio order. I added the word “Happy” above the die cut using the Cozy White Mini ABC Sticker Sheet from the Feel Likes Fall Collection. I also added a few sentiment strips from the same freebie pack, and a few pink hearts from the XOXO Love Word Flags Die Cut Pack. After adding black splatters and a few lines of printed journaling this layout was complete! Now you can take a look at the process video that has an Inkscape & Cricut Design Space tutorial. Thank you so much for joining me today! Happy Crafting!